Those are DH tires alright! Only a disc on the front, though? You know what that’s called? A bike mullet! 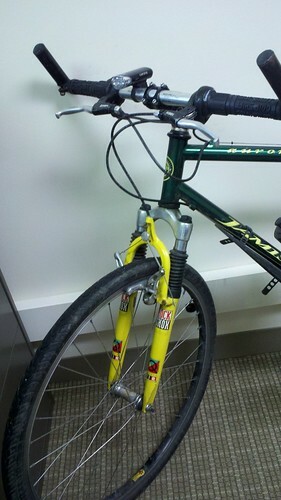 Too bad the Green Machine has that brake arch on the fork (so oldschool! )…otherwise, you could put one of those half-fenders that plug into the bottom of the fork steerer and lengthen it with a homemade mudflap. I have a similar setup on my Xtra, and it provides almost as much coverage as a full fender. @Ghost – I would like to swap out that fork – possible? – for that very reason. Maybe I’ll find a set-up at this Saturday’s Winter Bike Swap out in the northern suburb of Palatine. Nice prep work! I wimped out yesterday, for once actually BELIEVING the weather forecasters . 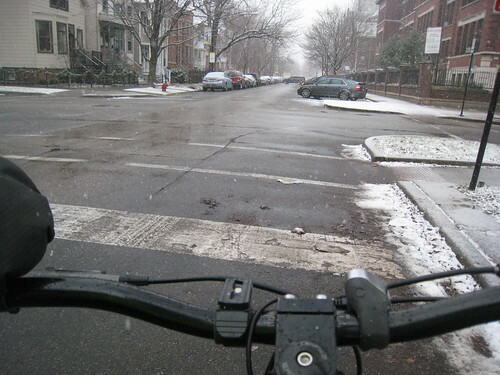 . . only to be let down again as the roads looked more than adequate for riding. I tried some drastic prep work too — putting some tire chains on an old bike that had been sitting unclaimed in our condo’s bike room, but it is too short (the bike) and made riding miserable. 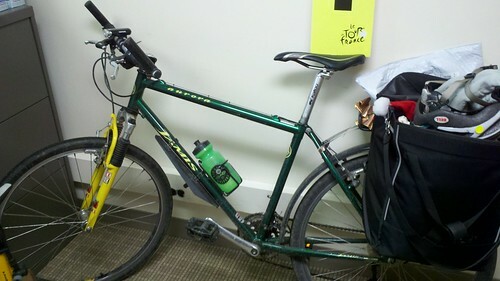 I’m back atop my very old Trek 7000 shod with Conti Winter tires. If you know anyone who wants to buy some chains, let me know. I cannot mount them on the Trek and clear the fenders. 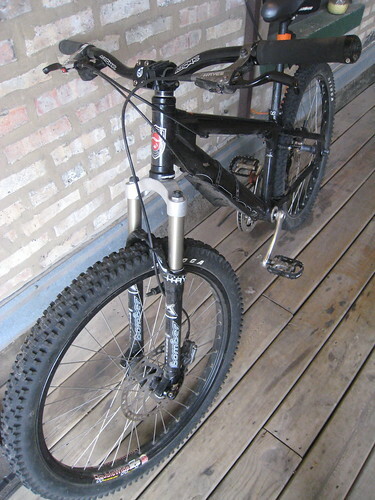 @E — a fork swap should be easy…unless that bike has a 1″ headtube. I can’t tell if the headset is threaded or not, either. If it’s a threadless 1 1/8″ tube (the ideal setup), just make sure you buy one with canti studs, no arch and a long enough steerer so you can cut it to length. I can talk you through the process if need be. 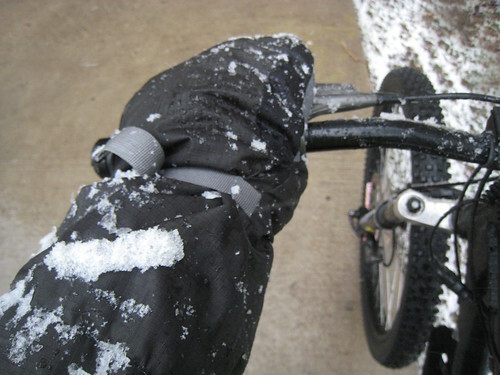 Yeah, we been Winter Bike Commuting in Phoenix for a while now: had to put on a sweat shirt underneath my windbreaker. You can put a fender on that existing fork on the Green Machine no problem! I wish I had photos for this…never took any…. I used some Planet Bike Speedez ATB fenders, as they don’t need fender mounts on the fork (once in position, I used zip-ties instead of the rubber-bands to secure them). The stock Planet Bike method for mounting the top of the fender to the fork is to simply use a zip-tie. That was too shaky, so I ordered an extra mount from the Planet Bike spare parts page. The fender mound is intended for the rear fender (one actually comes in the Speedez kit for the rear), but I figured it would work just fine on the front. It allows for a bit of vertical and horizontal adjustment, so I bolted it on using the hole at the bottom of the fork arch…perfect fit! Very Stable! It was -48 C for my morning commute today in Saskatoon and no sign of it getting warmer. -48 C! Holy cow, that is INSANE! That’s cold enough to do the “boiling water” trick, where you boil water, throw it up into the air and it turns to ice before it hits the ground. Fun winter stuff like that is a novelty for me (a longtime Florida resident and recent transplant to a place that gets an actual winter). Wow is right! Makes these single digit wind chills seem like summer, huh? What are you riding up there in Saskatoon? 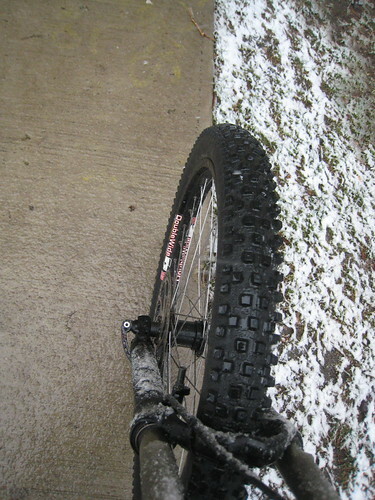 I ride a single speed mountain bike with Schwalbe ice spiker pro tires. My coldest commute was 4 years ago, -51C (I’m hoping to beat that record this year). In these temperatures every inch of your skin has to be covered or you will get frost bite in seconds. We also have a bike event each year called Ice Cycle and for a small city like Saskatoon we get a good turn out about 200 cyclists. Ah someone else who appreciates why mittens are so much better than gloves when the temperature really drops! 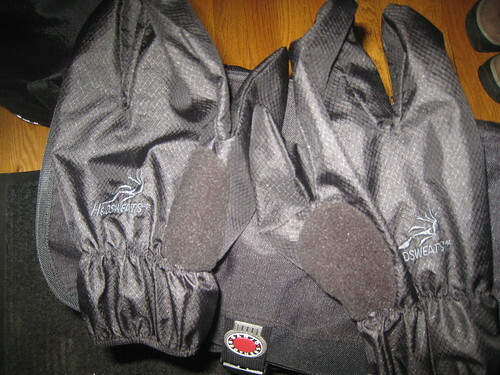 If you want a bit more control on the levers then check out Lobster type motorcycling gloves, basically they are split mittens with 2 parts – one for the index and forefinger and one part for the ring and little finger. Work great, especially with the bar guards that keep the wind off. Alternatively youve got those motorbike all in one fur lined bar attachments which are great unless you need to get your hand out in a hurry or at a funny angle.